ZillowThis waterfront townhouse near the Intracoastal Waterway in Englewood, Florida, offers potential as a weekend getaway or a rental. Looking to skip the hotel room and enjoy life on the water from your own private abode? Consider finding a home in one of the waterfront cities included in Zillow's Best Places to Buy a Vacation Home list. To make the interactive list, the city had to have more than 15 percent of its real estate dedicated to vacation homes. The homes also had to be within five miles of a body of water spanning more than 40 square miles. If you're hoping to turn that vacation home into an investment property, homes in these cities are expected to see strong home value gains (making for a better investment) and they also have good rental income potential (due to a low price-to-rent-ratio). Here's a look at 10 great places to buy a vacation home for beaches and boating. Anchors aweigh! If you are looking to purchase a property with the intention of offering it as a rental, Englewood is an excellent choice due to the area’s low price-to-rent ratio. With three bedrooms, an onsite community pool and clubhouse, and dock/moorage/storage access, this waterfront townhouse is well worth its price tag. See more homes for sale near the Intracoastal Waterway. Perched on Delaware Bay, about one-third of Downe Township homes are vacation homes. The township also has a low price-to-rent ratio, making this 4-bedroom beachfront home a great investment. See more homes for sale near the bay. The city of Astor offers something for everyone — proximity to the thrills offered by Disney World and the serenity of Ormond Beach. This two-bedroom riverfront home offers ample boating and fishing access. See more homes for sale by Lake George. High on our Second Home Index list of beaches and boating destinations, Crisfield is an excellent place to invest in a vacation home. Overlooking the Annemessex River, this 4-bedroom townhouse has access to a community pier and beach. See more homes for sale near the Chesapeake Bay. Fort Myers Beach is a thriving vacation home community and half of the city’s homes are vacation homes. This 2-bedroom waterfront home can accommodate up to a 70-foot yacht and has a 15,000-pound boat lift. 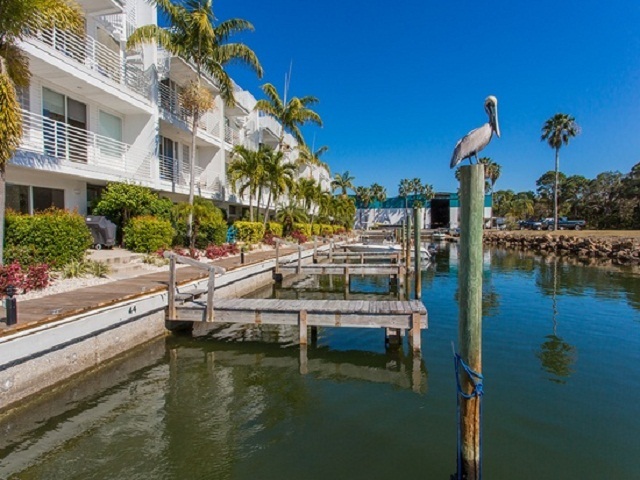 See more homes for sale in Fort Myers Beach. This 3-bedroom 2,589-square-foot Oak Hill waterfront home has abundant fishing opportunities and ample space to dock a boat. The area’s location offers easy access to some of Florida’s best beaches. See more homes for sale near Daytona Beach. One-third of homes in Bonita Springs are vacation homes, making this an ideal community for those shopping for a second home. This two-bedroom, two-bathroom remodeled home features a boat dock and a 10,000-pound boat lift with new motors. See more homes for sale near Estero Bay. Deal Island homes located on Chesapeake Bay have a low price-to-rent ratio and about one-third of homes are vacation homes. This 3-bedroom updated home is directly on the waterfront. See more homes for sale near the bay. Adjacent to ritzy Jupiter Island and beautiful beaches, Hobe Sound is high on the Second Home Index list of beaches and boating destinations. This updated, 2,362-square-foot home is located “between two inlets on pristine waterways,” according to the listing. See more homes for sale in Hobe Sound. Port Salerno ranks at the very top of our Second Home Index list of beaches and boating destinations, with the region expecting to see strong home value gains. This 2,326-square-foot townhome listed as “a boater’s dream come true” has a deep water dock that can accommodate up to a 52-foot boat. See more homes for sale in Port Salerno.